As many of you know, Christopher, has a rare genetic disorder PMM2 CDG. This disorder affects nearly every part of his life. He has vision abnormalities, hearing loss, cerebellar atrophy, heart, liver and kidney abnormalities, central hypothyroidism, low muscle tone, a blood clotting disorder and he’s fed via GJ tube. He’s at risk for seizures, strokes, and stroke-like episodes. Nothing comes easy for him and in order for him to continue to amaze us with reaching milestones intensive therapy is a must! Christopher is an amazing, determined little boy who deserves the chance to sit, crawl, and someday walk. Not only does intensive therapy help him with his physical development but it also is needed for speech and oral intake. There is nothing he doesn’t work extra hard to achieve! 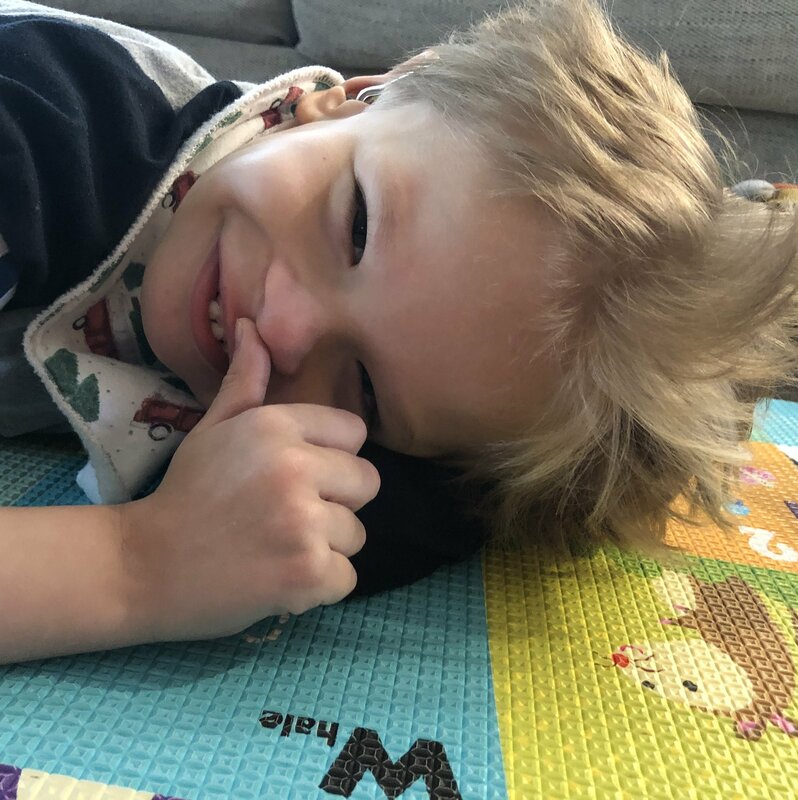 Christopher does have medical insurance, but unfortunately it won’t cover the intensive therapy he needs out of state.The costs of receiving treatment in California at Neurological and Physical Abilitation Center (NAPA) is costly, but the results are so very worth it! To help with the financial burden of Christopher’s uninsured expenses, a fundraising campaign in his honor has been established with Help Hope Live, a trusted nonprofit organization that has been providing community-based fundraising guidance to patients and their families for more than 30 years. All donations are tax-deductible to the full extent allowed by law, are held by Help Hope Live in the Great Lakes Catastrophic Illness Fund, and are administered by Help Hope Live for illness-related expenses only. Please consider making a contribution by clicking donate now. Thank you so much for helping make a huge difference in Christopher’s life. Your contributions will help him do so much we all take for granted! Be sure to check his fundraising page as I’ll post updates regularly on his amazing progress. On February 8 Christopher had his first seizure. We knew he was at risk for seizures but I was really holding out hope that just maybe we’d escape them. As we were all winding down on the 8th Christoper was happily watching a show on the floor until all of a sudden I heard him making gurgling sounds and ran over to him. I picked him up and immediately told Ryan to call 911. He was lifeless, barely breathing and unresponsive. I laid him on his side and monitored his breathing until the paramedics arrived. After we arrived at the hospital he was returning to his baseline, thankfully! He had an EEG in the hospital but nothing was captured, which we expected. We had an appointment with a neurologist and she said to expect it to happen again. We have rescue medication and his metabolic specialist said he will need to be evaluated after his seizures regardless of if we think he’s back to baseline or not. So now we prepare and hope they are few and far between! We are gearing up to head back to California for another 3 week NAPA intensive! We have seen so many gains from his intensives. Although many may seem small to others they are huge for Christopher. His head control ihas improves, his stability while sitting, his ability to push up to sitting AND bring both legs in front of him. We are so proud of how hard he works and it can be extremely wearing at times and emotional we know that the intensives help him a ton! We have 5 hours a day scheduled, total of 75 hours. I am really looking forward to what he will accomplish on this next intensive! In about a month Christopher will be heading back to NAPA for his 4th intensive. We are so excited to be doing 4 weeks this year instead of 3. Over the past year Christopher has been tummy scooting all over the place and he’s also getting so good at pushing himself up to sitting. He can get to a sitting position from his back, side, and tummy. His balance is still off and he will fall without protecting himself but we know soon he’ll be balancing like a pro. He is such a determined little boy! Thank you for your support!! We are getting very close to our departure date of February 18 for Christopher’s intensive therapy. We are so excited to see what he will be able to accomplish in the 3 weeks we are away! Thank you for continuing to donate and share his campaign page! Here is a video from Christopher’s April 2016 intensive. He was SO strong and powered through 4 weeks of therapy, 4 hours each day. We saw him achieve great things and can’t wait to get back to NAPA! I’ve added a video of Christopher and what he’s been up to! Christopher is awesome and so is his family!